A Denver car accident attorney discusses the dangers of distracted driving & CO cellphone laws for drivers. 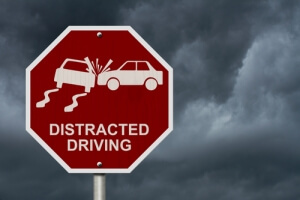 In 2013, 3,154 people were killed in motor vehicle crashes involving distracted drivers. An additional 424,000 people were injured. This represents a 6.7 percent decrease in the number of fatalities recorded in 2012 and an increase from the 421,000 people who were injured in 2012. At any given daylight moment in the USA, more than 660,000 drivers are using cell phones or manipulating electronic devices, while driving. Their risk of an accident is three times higher than non-distracted drivers. Studies show that the use of cell phones while driving is as dangerous as driving after consuming four alcoholic beverages. The largest portions of distracted drivers are in their 20s. They make up 27 percent of the distracted drivers in fatal crashes. 10 percent of drivers under the age 20, involved in fatal crashes, were reported as distracted at the time of the crash. 25 percent of teens will respond to a text message once or more every time they drive. 20 percent of teens and 10 percent of parents admit that they have extended multi-message text conversations while driving. While texting, the average time your eyes are off the road is five seconds. At 55mph, that’s enough time to cover the length of a football field, blindfolded. Even knowing the dangers of texting and driving, most drivers have no problem making a phone call or two while behind the wheel. In 2009, 9-year-old Erica Forney and 63-year-old Jim Price, were struck and killed by inattentive drivers. In the wake of the two highly publicized deaths, then Colorado Governor, Bill Ritter, signed legislation restricting the use of cell phones while driving. Colorado Law bans the use of cell phones for drivers under the age of 18 at all times. Cell phone use is permitted in the case of emergencies. Persons over the age 18 can use their cell phones for phone calls only. Texting, emailing and twittering are banned for all drivers. Reports a person driving in a reckless, careless or unsafe manner. However, if you can’t wait to pick up the cell phone while driving, cell phone use is permitted in designated parking areas or in the shoulder lane. The Colorado driving law restricting cell phone use is a Class A traffic offense. The law requires officers to witness the offense before issuing a ticket. First time offenders are ticketed $50. Second time offenders are ticketed $100. When you receive a call or text on your cell phone while driving your vehicle, find a safe place to pull over or wait until you reach your destination to respond. Having awareness at all times will make a big impact on the overall safety of our roads. Taking these simple precautions can significantly reduce the risk of an accident. If you are involved in a Motor Vehicle Accident and you suspect the other driver was texting on his cell phone, be sure and tell your Denver car accident attorney at Bell and Pollock. Your attorney can investigate whether or not cell phone use, while driving, contributed to the accident. If it did, you may be entitled to punitive damages in addition to regular damages. Unless you talk to an attorney, you might not get all the recovery that you entitled to.